Welcome to Stop 27 and Chapter 27 of the CONSEQUENCES audioBOOK blogTOUR! 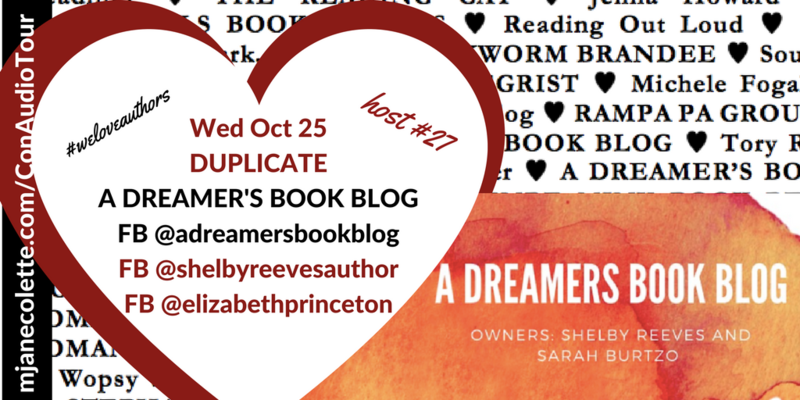 If you’re in a hurry to listen to Chapter 27: DUPLICATE, hurry over to A DREAMER’S BOOK BLOG! Me: Run run to A DREAMER’S BOOK BLOG to find out! You: Hey that link takes me to Facebook, and I don’t use Facebook. Me: Go HERE. Yes, I think of everything. Ready for today’s introductions of the hosts of the Consequences Audio Tour? Stop 27 (and Chapter 27) are hosted by A Dreamer’s Book Blog, a collaboration by romance-loving and romance writing friends Shelby Reeves and Sarah Burtzo (who writes as Elizabeth Princeton). Elizabeth Princeton writes contemporary romance, and her most recent novel is called Taking The Shot. Shelby Reeves most recently title is called Holding On For You. They started A Dreamer’s Book Blog in April 2016 as a way to give back to the romance community and are enthusiastic readers and promoters. Smooches, ladies! I am thrilled that A Dreamer’s Book Blog accepted my invitation to be part of the Consequences Audio Tour, and I hope their readers enjoy the dramatic DUPLICATE chapter. Thank you, Shelby Reeves​, Elizabeth Princeton-Author​, & A Dreamers Book Blog​! Back up link for non-FB users: HERE. I am now not sure where you’re getting your information, but good topic. I needs to spend a while studying more or understanding more. Thanks for magnificent information I used to be searching for this information for my mission. I am no longer positive the place you are getting your information, however good topic. I needs to spend some time finding out much more or figuring out more. Thanks for fantastic information I was searching for this information for my mission. I’m not positive where you’re getting your info, however good topic. I must spend a while finding out much more or working out more. Thank you for wonderful info I was in search of this info for my mission.